People think shopping for a ‘Geek‘ is pretty easy. Just grab anything that says ‘Star Wars‘ or ‘Marvel Comics‘ on it and you are all done and can go back to your Hallmark Christmas Movie Marathon. I blame the popularity of the sit-com Big Bang Theory for this misconception. However most of the Geeky themed gift ideas that could be considered “cute” are also the gifts that never get opened and later find themselves thrown into a donation/re-gift pile. This year, how about getting that special geek in your life an affordable gift they will actually enjoy and get some use out of! Now that Lil’ G-Man is getting older, I am having a harder time finding activities to keep him busy (and there is only so much Little Baby Bum and Baby Shark I can stand). Everything from creating your own custom epic slip ‘n’ slide to building a working lamp with Lego bricks and CD’s can be found in this masterpiece. This magnetic wristband is the ultimate stocking stuffer for any engineer, builder, ‘HandyDad’ and the ‘not-so-handy-but-likes-to-pretend-to-be-dad’ (like myself). This fully adjustable one-size-fits-all wristband is made of durable water resistant polyester and strong magnets to hold your nuts in place. As well as your nails and screws. And at just $11.99 with free shipping for Prime members, you can’t argue with the price. Perfect Gift For The Beer Loving Dads! Brew Candy is inspired by popular craft beer flavors, and as such is a perfect fun gift for beer geeks, candy lovers, foodies, homebrewers, chefs, caterers, men, women, and everyone with good taste! This package includes: THREE BEER-INSPIRED FLAVORS: Honey Ale (honey, banana, malted barley flavor), Hoppy IPA (herbal, spicy, bitter flavor), and Roasty Stout (roasty, grainy, chocolatey flavor). Perfect for tailgating, the office, watching the game with the in-laws or while just hiding from the family in your man cave, these made in the U.S.A. candies are a tasty way to pass the time. For the Geek and Hipster alike! The Beard Geeks Grooming Kit is constructed with premium quality materials to the highest quality standards you should expect for your badass beard; includes all the essentials, a hand made wooden 100% boar bristle brush, a shaping comb tool, all natural sandalwood scented beard oil and balm allowing you to become a professional beard barber. Not all geeks are hipsters and not all hipsters are geeks. But facial hair, fedoras and Indiana Jones are overlaps that most can agree upon! Geeks and Hipsters have common ground! Some people love him. Some people despise hm. But we can all agree on at least one thing about the 45th POTUS: He was some funky hair. What better way to celebrate (or mock) the leading hair of the free world than with this well detailed Troll doll. From the flowing golden locks, to the facial articulation and the red power tie, this figure as all the tools necessary to make your desk or collectible shelf great again! 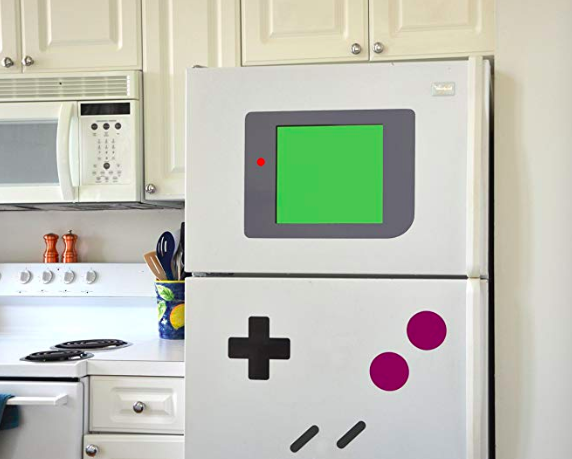 This Appliance Has Leveled Up! If you don’t have a special nostalgic place in your heart for Nintendo’s original GameBoy, you are not a true geek. This set of six large removable magnets will turn any appliance into your new home for 80’s nostalgic memory. The ‘screen’ doubles as a 16″ by 12″ dry erase board. Hopefully you found this lists to be helpful for your holiday shopping. Please continue to support our site by purchasing your Amazon gifts through our affiliate links. Previous Could We See Count Chocula Face Off With Batman In An Animated Movie Soon? Next Is Disney Moving Forward With A Ben Kenobi Star Wars Movie Helmed By George Lucas?